Abuja – The race for the Senate President has begun with key lawmakers in the red chamber meeting to position themselves for the exalted seat. The All Progressives Congress (APC) has so far won 64 Senate seats and the PDP 41. The Young Progressives Party (YPP) has 1. In the 8th Assembly, the number of PDP and APC senators were almost at par. Although there are three undeclared seats, one each in Kogi, Plateau, and Imo states, the APC is presently having the majority in the red chamber. With the APC having the highest number of senators, there is no gainsaying that the ruling party will produce the Senate President. It was, however, learned that the PDP, with the influence of the President of the Senate, Bukola Saraki, may spring some surprises in the coming days. It was gathered that the senators eyeing that exalted seat at the moment is the Senate Leader, Ahmad Lawan (Yobe); Mohammed Ali Ndume (Borno); Mohammed Danjuma Goje (Gombe), and Abdullahi Adamu (Nasarawa). It was also learned that senators from the South-South, namely Francis Alimekhena (Edo) and Ovie Omo-Agege (Delta) may likely slug it out for the position of the Deputy President of the Senate or may also take a shot at the Senate President’s seat. But speaking with our correspondent on Sunday, a source at the Senate leadership said the position may favor Goje, the former governor of Gombe State. 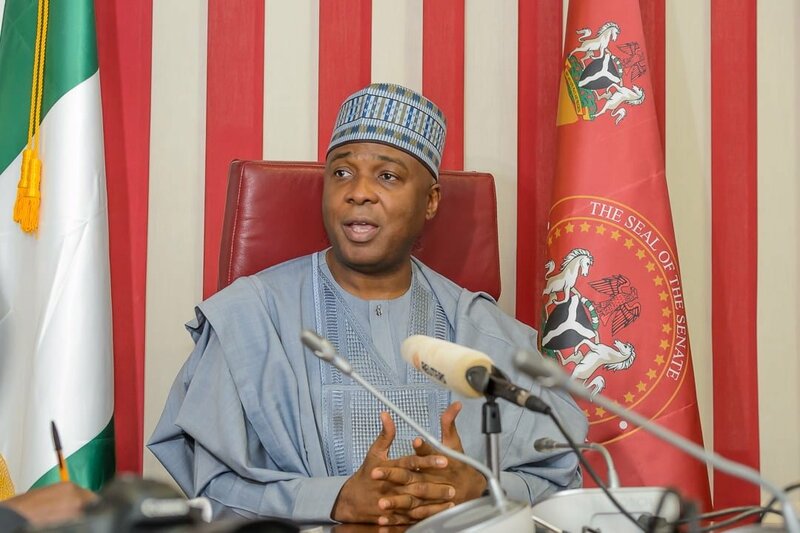 The source said the President of the Senate, Saraki, may not have won the election, but his factor could not be overlooked in the emergence of a Senate President in the 9th Assembly. The source said because of the closeness of Goje to Saraki, PDP senators and APC members who are still loyal to Saraki may toe his directive. The source added that the former governor of Sokoto State, Aliyu Magatakarda Wamakko, who is also a very close person to Saraki, may play a role in the emergence of the Senate President. The source said if the APC was not careful, the PDP might still produce the Deputy President of the Senate, adding that with the block votes of PDP members and APC senators who are still loyal to Saraki, the opposition party can spring a surprise in the 9th Senate. The source also said Lawan and Adamu, who were learnt are also interested, might likely not get it because the Senate might not want to be a rubber stamp of the executive and besides the PDP senators and APC lawmakers loyal to Saraki may not want to associate with them. The source emphatically said he didn’t see Remi Tinubu emerging as Deputy Senate President, and also added that Alimekhena is more favoured for the position. Meanwhile, the PDP will today hold an expanded caucus meeting to deliberate on the way forward on issues concerning the just concluded presidential and National Assembly elections. Meanwhile, Kabiru Gaya, Chairman, Senate Committee on Works, has said the Senate was bent on investigating the intrigues that culminated in the Independent National Electoral Commission (INEC) postponing the general elections earlier slated for February 16 and March 2, respectively. Recall that the electoral umpire for logistic reasons rescheduled the elections to February 23 and March 9, 2019. Gaya while interacting with State House correspondents at the weekend in Abuja, said the commission had no reason whatsoever to have postponed the elections because all that they required to conduct a credible exercise was provided to them. He said that the Senate would commence the investigation of the electoral umpire upon its return from recess after the governorship election. Speaking on his assessment of the performance of the electoral umpire at the just concluded presidential and National Assembly elections, he said, “I was not happy when they shifted the elections and I said still after shifting the election we will call them and we will investigate INEC for shifting the election because it caused poor turnout. On the kind of Senate expected in the 9th Assembly, Gaya said Nigerians should expect a humble Senate, a vibrant Senate, one that will work with Mr. President for the good of the country. He said, “We will give President Buhari all the cooperation that is needed so that we can have a smooth ride, a smooth process, a smooth passage of the budget, a smooth oversight and a relation between the executive and the legislature. We hope by God’s grace we will give him that support. He also said he was not surprised that President Buhari won the February 23 presidential poll because he has done so much for the country. Citing some of the achievements that contributed to the president’s victory for a second term, Gaya said the drastic drop in the importation of rice from 100 percent to five percent, roads and railway projects. “I am the Chairman, Senate Committee on Works, so I know that the budget for the 2014 before President Buhari came in was N22 billion. But when Buhari came into office the budget moved up to N220 billion and you can see now the budget is between N300 billion and N400 billion in 2019. Therefore, the roads that were neglected for nineteen years are now motorable. Also, agriculture, the importation of rice has dropped from 100 percent to only five percent,” he added. “I believe most of the problem was that INEC shifted the elections and people thought that the election would be shifted again and they couldn’t come out to vote. We had just about 30-40 percent turnout all over the country. “But be that as it may, Kano has delivered, we had the highest number of votes and I think we could say that we are part of the determining factors for President Muhammadu Buhari reelection because he has really done so much for us – the dualisation of Kano-Abuja road and the railway project and so on. “We are very happy that President Buhari has done that and we believe we will do better. We from the National Assembly, I assure you, I am coming in as a senator for the fourth term – 16 years I am one of the few ranking senators in the Senate and I thank God for being in the Senate,” the reelected senator stressed.